Flow chart of total cohort and included aneurysms. 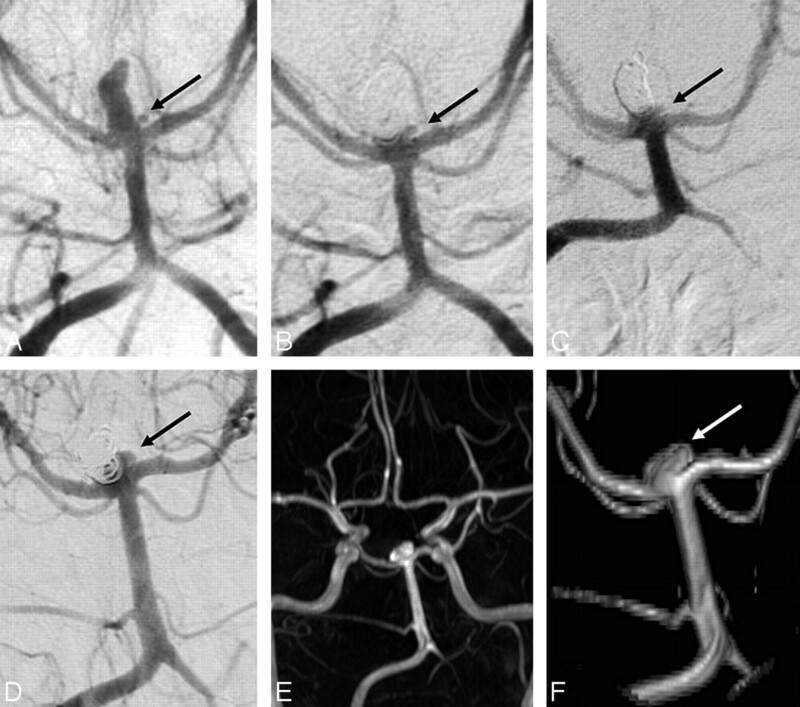 A 61-year-old woman with a ruptured 3-mm middle cerebral artery aneurysm. A, Precoiling angiogram shows a small aneurysm. B, Complete occlusion after coiling. C, Stable complete occlusion at 6 months. D, MRA at 7.3 years demonstrates a 1 × 2 mm intraluminal opening inside the coil mesh classified as a recurrence (arrow). A 54-year-old woman with a ruptured 5-mm basilar tip aneurysm. A, Precoiling vertebral angiogram shows a basilar tip aneurysm. B, Stable complete occlusion at 6 months. 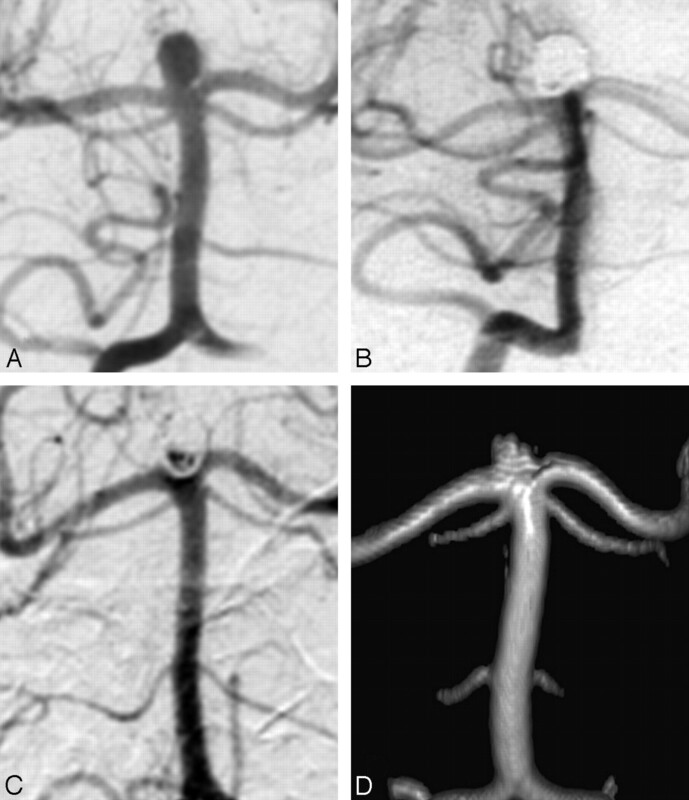 C, Angiogram at 5.8 years shows a 2 × 3 mm disklike recurrence at the base of the aneurysm. D, MRA at 8.0 years is unchanged, compared with the last angiogram. 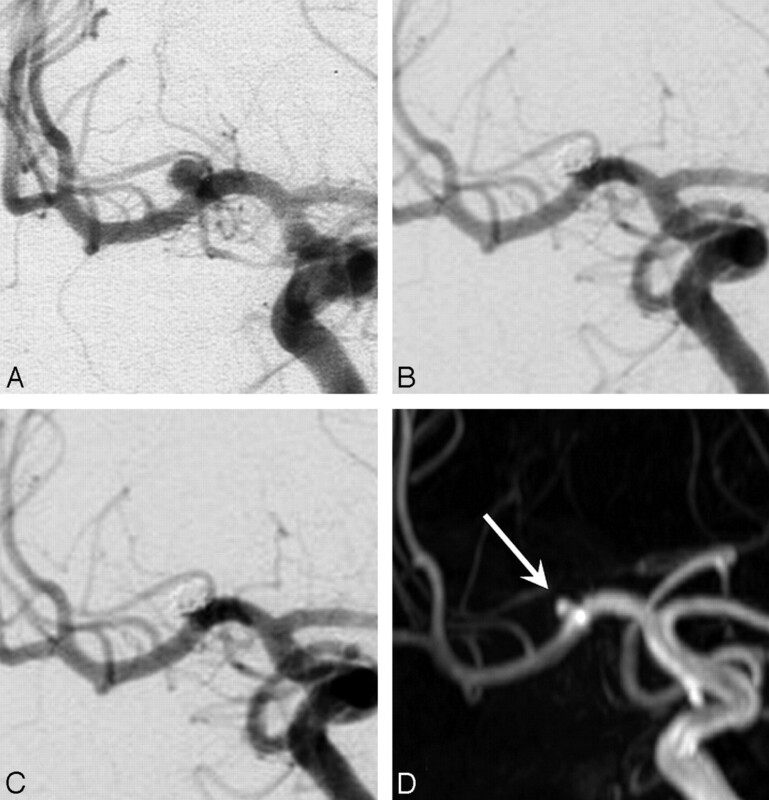 A 49-year-old woman with a ruptured 10-mm basilar tip aneurysm. A, Precoiling vertebral angiogram demonstrates the basilar tip aneurysm with a small bleb on its base (arrow). B, On the angiogram immediately postcoiling, the bleb (arrow) is not occluded. C, Unchanged open bleb (arrow) at 6 months. D, Angiogram at 5.5 years with recurrence (arrow) at the base from the bleb. 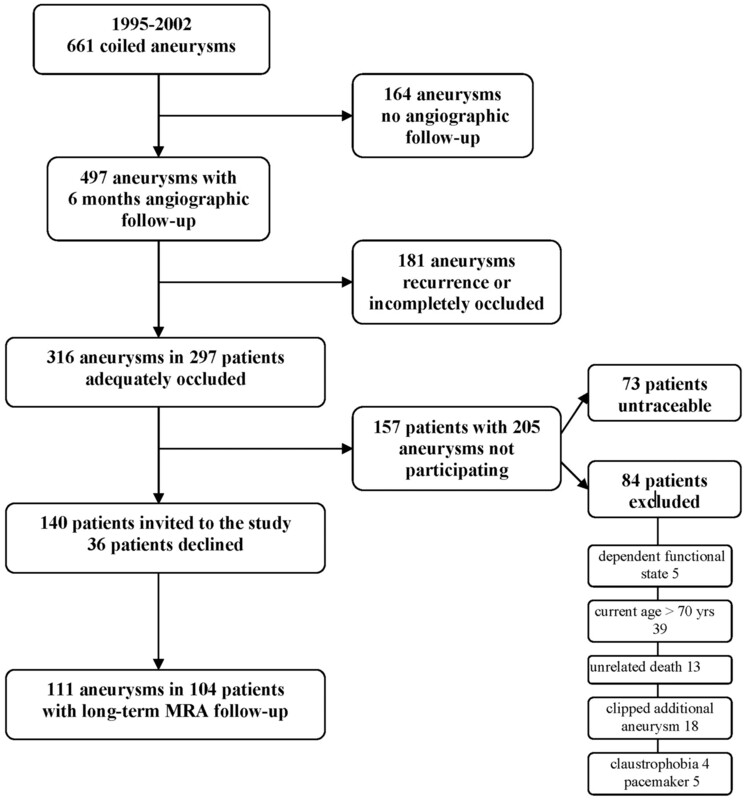 E and F, MRA overview (E) and detail (F) at 8.1 years demonstrate unchanged recurrence (arrow). A 66-year-old man presenting with seizures with an unruptured left middle cerebral artery aneurysm. A, Precoiling angiogram. B, Complete occlusion after coiling. C, Stable complete occlusion at 6 months. D, MRA at 6.6 years shows a 6 × 4 mm recurrence (arrow). E, Angiogram before the second coiling. F, After the second coiling, again complete occlusion is seen. G, Six months after the second coiling, repeat reopening of the aneurysm is noted. H, After the third coiling, again complete occlusion is seen. Note that the coil mesh is much larger than the aneurysmal lumen in A. I, Initial CT angiography before the first coiling demonstrates thrombus surrounding the aneurysm lumen and perifocal edema. J, MR imaging at 6.6 years shows migration of the coil mesh in the thrombosed part of aneurysm and a perianeurysmal cyst. Note:—ACA indicates anterior cerebral artery; MCA, middle cerebral artery; ICA, internal carotid artery. Counterpoint: Has the Last Word Been Said?